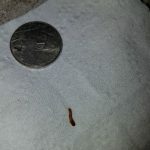 One of our readers recently sent us a photograph of a worm-like organism she found on her bed. She also noticed some itchy bug bites on her body, so she wants to know if this creature could be the source. The photo is a little blurry, but it shows a small brown organism. 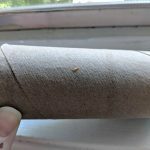 Based on the appearance of the creature and where our reader found it, we are confident that she is dealing with carpet beetle larvae. 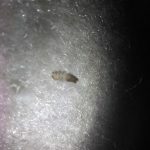 Carpet beetle larvae are extremely common household pests. They eat animal products such as wool, felt, feathers, and leather, and also items like upholstered furniture, carpeting, pet food, dried foods, and other small particles found throughout a home. Since their diets include such a wide variety of things found in a house, readers find them in various different rooms. However, they are most commonly discovered in the bedroom! 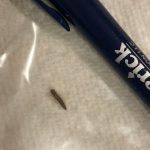 Since our reader found this larva on her bed, we think it is probably eating one of her bedding items such as her mattress, comforter, pillow, or sheets. She will need to investigate her bed and the area around it to be sure. Once she finds the primary food source she should remove the item and either throw it out or have it professionally cleaned to eliminate any other larvae or eggs that could be hiding in it. She should also wash all of her bedding and clean her entire room. 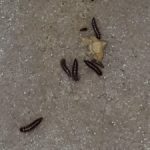 While all the cleaning might seem excessive, it is the only way to successfully get rid of carpet beetle larvae and their potential food sources. She should vacuum, sweep, and dust her entire room every day for about two weeks, or until she is confident her room is free of larvae! If she notices carpet beetle larvae in other rooms of her home, she will also need to thoroughly clean those rooms. Now, about the itchy bug bites. 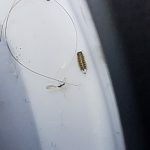 Carpet beetle larvae don’t technically bite, but they are covered in tiny bristle-like hairs that can cause an irritating allergic reaction on some people. This rash is called carpet beetle dermatitis. We don’t know if this is what our reader is experiencing, or if the bug bites are from a different specimen. If our reader is concerned about her health, then we encourage her to visit a doctor who will be able to diagnose and treat her if necessary! 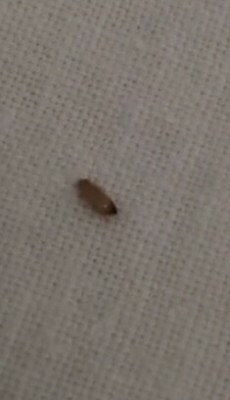 To conclude, the small worm our reader found on her bed is a carpet beetle larva! 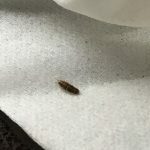 Carpet beetle larvae are common household pests, and to get rid of them our reader will just need to do some thorough cleaning. The small worm our reader found on her bed is a carpet beetle larva! 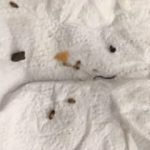 Carpet beetle larvae are common household pests, and to get rid of them our reader will just need to do some thorough cleaning.